In 1907, McNeill & Libby started its first fruit cannery in Sunnyvale, California. It quickly became the largest employer with a predominantly female workforce. In the early 1900s, it established a pineapple canning subsidiary in Hawaiʻi and began to advertise its canned produce using the ‘Libby’s’ brand name. Unlike the other bigger pineapple producers, Libby did not start in Central Oʻahu, it started in Windward O‘ahu. Libby’s pineapple covered the southern portion of Kāne’ohe, what is now the Pali Golf Course, Hawaiian Memorial Park and the surrounding area. By 1923, it was evident that pineapple cultivation on the Windward area could not keep up with that in other O‘ahu areas. Then, Libby began to grow pineapple on land leased from Molokaʻi Ranch; their activities were focused primarily in the Kaluakoʻi section of the island. Lacking facilities and housing, the plantation began building clusters of dwellings (“camps”) around Maunaloa. By 1927, it started to grow into a small town – as pineapple production grew, so did the town. By the 1930s, more that 12 million cases of pineapple were being produced in Hawaiʻi every year; Libby accounted for 23 percent. There were two main pineapple growers on Molokai, Libby, situated on the west side at Maunaloa and California Packing Corporation (later known as Del Monte) in Kualapuʻu in the central part of Molokaʻi. Then steps in a fledgling Hawaiʻi company, also seeing expansion opportunities, and it was through shipment of Libby’s pineapple from Molokaʻi to Libby’s processing plant in Honolulu that Young Brothers expanded into the freight business. In 1900, three brothers, William, Herbert and Jack, got into business along Honolulu’s waterfront. What started out working small, odd jobs running lines, delivering supplies and providing harbor tours ended up to be a company that has played an important role in the maritime community of the State. In those days, there might be from five to twenty sailing ships off Sand Island. When a ship came in, the anchor line had to be run out to secure the ship; if the ship was coming to the dock, a line had to be carried to the pier. In the early years of the company, the brothers carried supplies and sailors to ships at anchor outside the harbor, as well as run lines for anchoring or docking vessels. They also gave harbor tours and took paying passengers to participate in shark hunts. With expanded freight service to Molokaʻi (Kolo and Kaunakakai,) around 1929, Young Brothers initiated a practice of towing two barges with one tug and became known as tandem towing. The system was pioneered because two barges were needed to serve Molokaʻi – they would drop one barge off at Kolo and then carry on to Kaunakakai; they’d pick up the Kolo barge on the way back to Honolulu. Young Brothers continues today. In 1999, Saltchuk Resources, Inc of Seattle, Washington, the parent company of Foss Maritime, acquired Young Brothers and selected assets of Hawaiian Tug & Barge. In 2013, Hawaiian Tug & Barge was rebranded and incorporated into the Foss Maritime fleet, while Young Brothers remains a wholly own subsidiary of Foss. The youngest of the Young Brothers, “Captain Jack,” is my grandfather; several quotes in this piece include statements from my uncle, also known as Captain Jack. 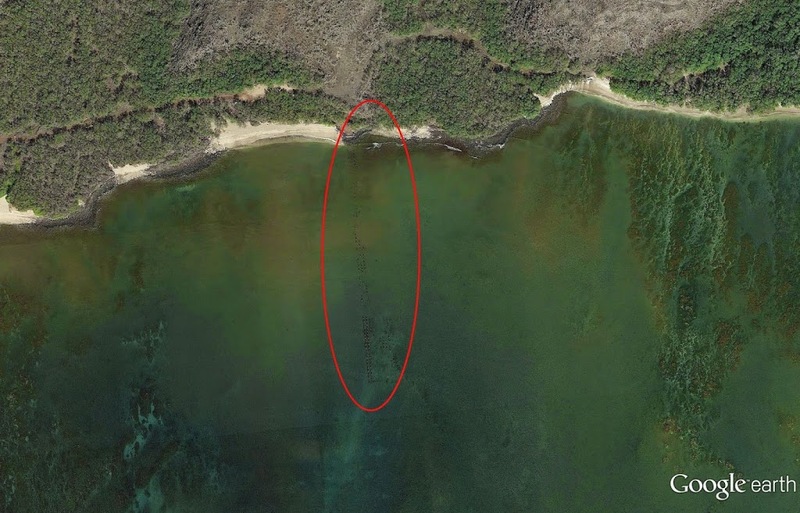 The image shows remnants of the Kolo Wharf (Google Earth.) In addition, I have added other images in a folder of like name in the Photos section on my Facebook and Google+ pages. For much of the 1800s, sailing ships calling at Honolulu Harbor were serviced using double-hulled canoes or rowboats. In 1900, three brothers, Jack, Edgar and William, formed Young Brothers and started doing small jobs around the Harbor. Early in the century, there was only a narrow opening in the reef, so sailing ships anchored outside where they had room to maneuver. They then came ashore in their own boats or used launch services from the harbor. Jack Young once reminisced about arriving in Honolulu in 1900 with a few cans of fruit, a large trunk and only twenty-five cents in cash – too little to pay to have his trunk brought ashore. So he rustled up a spare rowboat and rowed in his own gear. In the early years of the company, Young Brothers used its first boat, Billy, to service the ships by carrying supplies and sailors to ships at anchor outside the harbor, as well as run lines for anchoring or docking vessels. The company grew over the years into an active interisland freight company. When original brother Jack’s two sons became old enough, they joined the operation. Jack’s younger brother, Kenny Young, joined Young Brothers in 1946, after a stint in the Navy and graduation from Stanford. When OR&L merged with Dillingham Corporation, he was manager and vice president at Dillingham until 1968. Jack Young of the original Young Brothers is my grandfather; Jack Young Jr, my uncle; and Kenny Young, my father. Today, the Young family legacy at Young Brothers continues; my older brother, David Young, serves as a Hawai‘i County Community Advisory Board Member for the Young Brothers Community Gift Giving program. The image shows the Young Brothers Boathouse in 1902, in Honolulu Harbor. I have also included some other photos and maps showing typically older images of Honolulu Harbor and Young Brothers stuff (around 1900, the early era of Young Brothers) in a folder of like name in the Photos section.